Hillary Rodham Clinton's senior thesis at Wellesley College was on radical Saul D. Alinsky. In the acknowledgments, she jokes about not having a "loving wife" to thank for keeping the kids at bay while she wrote. On page 65, she decries the pervasiveness of racism and bigotry. And in the notes at the end, she talks about her decision to forgo a job for the rigors of law school. 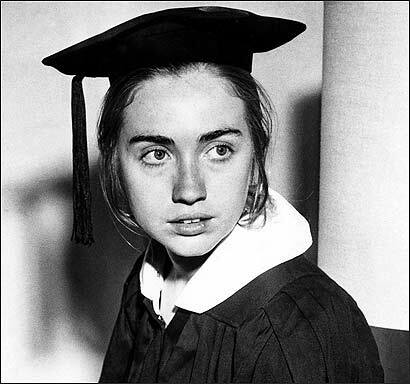 But what is perhaps most striking about Hillary Rodham Clinton's senior thesis at Wellesley College is the way in which she grapples with such labels as radical and liberal and what they mean, questions she is wrestling with now as she runs for president. The 92-page thesis, "There is Only the Fight: An Analysis of the Alinsky Model," explores the life and methods of Saul D. Alinsky , a firebrand activist who organized the poor in Chicago to lobby in the 1930s for better housing and social services. During Clinton's tenure as first lady, the thesis was kept under lock and key in the Wellesley library, and its legend grew among conservatives. Many speculated the thesis, written in 1969, would prove the 21-year-old political science major was an extremist in the thrall of an avowed political radical. But a closer look at the text, which has been available to the public since 2001, paints a more complex portrait. While Clinton defends Alinsky, she is also dispassionate, disappointed, and amused by his divisive methods and dogmatic ideology. "Those who are anti-Clinton have made all kinds comments with reference to this thesis, which they haven't even read," said Alan H. Schechter , an emeritus professor of political science at Wellesley, who was one of Clinton's thesis advisers. "But if you take a look at it, you can see that it's quite nuanced." In her thesis, Clinton quotes Alinsky as saying, "The radical believes all people should have a high standard of food, housing, and health . . . the radical places human rights far above property rights . . . the radical believes completely in real equality of opportunity for all peoples regardless of race, color or creed." Then Hillary D. Rodham , as she was known, offers her view. "Much of what Alinsky professes does not sound 'radical,' " she writes. "His are the words used in our schools and churches, by our parents and their friends, by our peers. The difference is Alinsky really believes in them and recognizes the necessity of changing the present structures of our lives in order to realize them." Schechter said the thesis received an A grade. Controversy surrounding the document dates to 1993, when Schechter said he got a call from someone in the Clinton White House -- he said he cannot remember who it was who called -- saying the president and first lady wanted the thesis kept out of public view. Schechter said the White House was concerned the thesis was critical of Daniel Patrick Moynihan , who was a US senator from New York in the 1990s. Schechter said he argued the document should stay available to the public. Schechter's account was first reported by MSNBC.com. "It's a good thesis," he said in an interview yesterday . But in 1993, Wellesley removed the thesis from circulation. In 1995, the college, citing the fact that theses are copyrighted, adopted a rule: the senior thesis of any president or first lady should not be publicly available. So far, the rule has applied only to Clinton. "There was a recognition that with Mrs. Clinton, there would be more interest in her thesis than there would be in most of the other alumna," said Mary Ann Hill , a Wellesley spokeswoman. "And there was enough ambiguity in our understanding of the copyright laws that the decision was to err on the side of caution and not make it publicly available." The rule only fueled interest in the thesis. "Most likely, she does not want the American people to know the extent to which she internalized and assimilated the beliefs and methods of Saul Alinsky," wrote Barbara Olson , the conservative author of the 1999 biography of Clinton, "Hell to Pay: The Unfolding Story of Hillary Rodham Clinton." In 1995, President Reagan's former speechwriter, Peggy Noonan , called the thesis "the Rosetta Stone of Hillary studies." Ancient stones aside, Clinton's thesis confronts some of the problems she is facing now. Alinsky, like Clinton, was often accused of being too far to the left. She notes that he was said to "rub raw the sentiments of the people." "Alinsky answers such criticism by reminding his critics that the difference between a 'liberal' and a 'radical' is that the liberal refuses to fight for the goals he professes," Clinton wrote. She writes that Alinsky, whom she interviewed twice, "is regarded by many as the proponent of a dangerous socio/political philosophy. As such, he has been feared -- just as Eugene McCarthy or Walt Whitman or Martin Luther King has been feared, because each embraced the most radical of all political faiths -- democracy." She adds, "Democracy is still a radical idea in a world where we often confuse images with realities, words with actions." Alinsky, author of "Rules for Radicals," was a powerful and popular figure on college campuses in the 1960s, and Clinton calls him "charming." He asked Clinton to join him at an activist training institute in Chicago after she graduated. But she turned him down to attend Yale Law School. Alinsky died in 1972 . "His offer of a place in the new Institute was tempting," Clinton writes at the end of her thesis, "but after spending a year trying to make sense out of his inconsistency, I need three years of legal rigor."